Billy Wilder, D.M. Marshman Jr.
A mordant, macabre film noir that really ups the ante on the genre’s doom-laden determinism and fatalism – the movie is narrated by a corpse! – Sunset Boulevard was the final collaboration between Billy Wilder and long-time writing partner and producer Charles Brackett, and their second film together to win a screenwriting Oscar. The famed opening of this acid account of Hollywood decadence has a dead man floating face down in a swimming pool. William Holden's off-screen voice identifies itself as that of the deceased, and proceeds to relate the sordid events that led to his demise. Holden is Joe Gillis, a down-at-heels Hollywood screenwriter. Fleeing the repo men after his car, he takes a wrong turn into the run-down estate of Hollywood has-been Norma Desmond (Gloria Swanson), an aging, embittered former silent star living entombed in a mausoleum-like mansion. With nothing better on the go, spineless Joe allows himself to become a kept man in Norma's smothering clutches, and is soon in way, way over his head. Erich von Stroheim co-stars as Norma's devoted butler Max; Buster Keaton, Hedda Hopper, and Cecil B. DeMille have cameos. Wilder’s classic is noir at its most brittle, bizarre, and baroque – and "certainly the blackest of all Hollywood's scab-scratching accounts of itself". (Geoff Andrew, Time Out). Billy Wilder's Sunset Boulevard is the portrait of a forgotten silent star, living in exile in her grotesque mansion, screening her old films, dreaming of a comeback. But it's also a love story, and the love keeps it from becoming simply a waxworks or a freak show. Gloria Swanson gives her greatest performance as the silent star Norma Desmond, with her grasping talons, her theatrical mannerisms, her grandiose delusions. 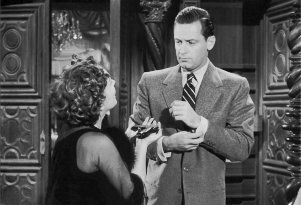 William Holden tactfully inhabits the tricky role of the writer half her age, who allows himself to be kept by her. But the performance that holds the film together, that gives it emotional resonance and makes it real in spite of its gothic flamboyance, is by Erich von Stroheim, as Norma's faithful butler Max. The movie cuts close to the bone, drawing so directly from life that many of the silent stars at the movie's premiere recognized personal details. In no character, not even Norma, does it cut closer than with Max von Mayerling, a once-great silent director, now reduced to working as the butler of the woman he once directed - and was married to. There are unmistakable parallels with von Stroheim, who directed Swanson in Queen Kelly (1928), whose credits included Greed and The Merry Widow, but who directed only two sound films and was reduced to playing Nazi martinets and parodies of himself in other people's films. In Sunset Boulevard, Desmond screens one of her old silent classics for Joe Gillis, the young writer played by Holden. Max runs the projector. The scene is from Queen Kelly. For a moment Swanson and von Stroheim are simply playing themselves. Later, when Joe is moved into the big mansion, Max shows him to an ornate bedroom and explains, "It was the room of the husband." Max is talking about himself; he was the first of her three husbands, and loved her so much he was willing to return as a servant, feeding her illusions, forging her fan mail, fiercely devoted to her greatness. Norma of course is not a wrinkled crone. She is only 50 in the film, younger than stars such as Susan Sarandon and Catherine Deneuve. There is a scene during Norma's beauty makeover when a magnifying glass is held in front of her eyes, and we are startled by how smooth Swanson's skin is. Swanson in real life was a health nut who fled from the sun, which no doubt protected her skin (she was 53 when she made the film), but the point in Sunset Boulevard is that she has aged not in the flesh but in the mind; she has become fixed at the moment of her greatness, and lives in the past. Billy Wilder and his co-writer Charles Brackett knew the originals of the characters. What was unusual was how realistic Wilder dared to be. He used real names (Darryl Zanuck, Tyrone Power, Alan Ladd). He showed real people (Norma's bridge partners, cruelly called "the waxworks" by Gillis, are the silent stars Buster Keaton, Anna Q. Nilsson and H.B. Warner). He drew from life (when Norma visits Cecil B. De Mille at Paramount, the director is making a real film, Samson and Delilah, and calls Norma "little fellow", which is what he always called Swanson). When Max the butler tells Joe, "There were three young directors who showed promise in those days, D.W. Griffith, Cecil B. De Mille and Max von Mayerling", if you substituted von Stroheim for von Mayerling, it would be a fair reflection of von Stroheim's stature in the 1920s. Sunset Boulevard remains the best drama ever made about the movies because it sees through the illusions, even if Norma doesn't. When the silent star first greets the penniless writer inside her mansion, they have a classic exchange. "You used to be big", he says. Norma responds with the great line, "I am big. It's the pictures that got small". Hardly anyone remembers Joe's next line: "I knew there was something wrong with them". The plot has supplied Joe with a lot of reasons to accept Norma's offer of a private screenwriting job. He's broke and behind on his rent, his car is about to be repossessed, and he doesn't want to go back to his job as a newspaperman in Dayton. He is also not entirely unwilling to prostitute himself; Holden projects subtle weakness and self-loathing into the role. He goes through the forms of saying he doesn't want Norma's gifts, but he takes them - the gold cigarette cases, the platinum watch, the suits, the shirts, the shoes. He claims to be surprised on New Year's Eve when she throws a party just for the two of them, but surely he has known from the first that she wants not only a writer, but a young man to reassure her that she is still attractive. There is of course the young blond Paramount writer Betty (Nancy Olson), who Joe meets early in the picture. She's engaged to be married (to a young Jack Webb), but as Joe begins sneaking out of the mansion to collaborate on a screenplay with Betty, she falls in love with him. He's attracted, but pulls back, partly because he doesn't want her to discover the truth, but also because he likes the lifestyle with Norma. And ... maybe because, like Max, he has fallen under her spell? His dialogue is sharp-edged and can be cruel. (When she threatens suicide, he tells her, "Oh, wake up, Norma. You'd be killing yourself to an empty house. The audience left 20 years ago".) But there's a certain pity, too. "Poor devil", he says, "still waving proudly to a parade which had long since passed her by". Of all the great directors of Hollywood's golden age, has anybody made more films that are as fresh and entertaining to this day as Billy Wilder's? The credits are astonishing: Double Indemnity, Ace in the Hole, Some Like It Hot, The Apartment, The Lost Weekend, Stalag 17, Witness for the Prosecution, Sabrina. And who else can field two contenders among the greatest closing lines of all time? From Some Like It Hot there is "Nobody's perfect". And from Sunset Boulevard, Norma Desmond's: "There's nothing else. Just us, and the cameras, and those wonderful people out there in the dark. All right, Mr. De Mille, I'm ready for my closeup". - Roger Ebert, 27 June 1999. This is a gorgeous image and one of the finest amongst those photographed in black-and-white. Grain remains over the image, and the transfer offers brilliant details across the board, from clothes to faces, from old camera equipment to textured exteriors. The image is generally very crisp and naturally sharp; there are certainly a few softer shots, but the sturdier and more well-defined moments dominate. Black levels are fabulous, whether dark suits or shadowy backgrounds. The print is meticulous, very clean and exact. Paramount's efforts are to be commended; this is top-flight and it most certainly does this classic and historically significant film the justice it deserves. Paramount's audio presentation is largely dialogue-focused and plays the spoken word with clear syllables and grounded, front-center location. As for the other elements, range is obviously limited to practically nothing. The presentation hangs right in the middle of things, only presenting sound effects and music rather than immersing the soundstage in them. In this case, that's perfectly acceptable. The soundtrack's music can be a touch crunchy at times, lacking precise definition but replicating the original elements to satisfaction. Minor ambient and general sound effects both are presented with suitable clarity, such as the clack-clack-clack of an old movie projector as heard in an otherwise silent environment. To be sure there are some slightly muddled and unkempt sound elements, but generally this is a very good, classy presentation that should please purists. - adapted from Martin Liebman, Blu-ray.com, 22 October 2012.